Kobolds are creatures of the dark, found most commonly in enormous underground warrens or the dark corners of the forest where the sun is unable to reach. Due to their physical similarities, kobolds loudly proclaim themselves the scions of dragonkind, destined to rule the earth beneath the wings of their great god-cousins, but most dragons have little use for the obnoxious pests. While they may speak loudly of divine right and manifest destiny, kobolds are keenly aware of their own weakness. Cowards and schemers, they never fight fair if they can help it, instead setting up ambushes and double-crosses, holing up in their warrens behind countless crude but ingenious traps, or rolling over the enemy in vast, yipping hordes. –4 Strength, +2 Dexterity, –2 Constitution: Kobolds are fast but weak. Small: Kobolds are Small and gain a +1 size bonus to their AC, a +1 size bonus on attack rolls, a –1 penalty to their CMB and CMD, and a +4 size bonus on Stealth checks. Normal Speed: Kobolds have a base speed of 30 feet. Darkvision: Kobolds can see in the dark up to 60 feet. 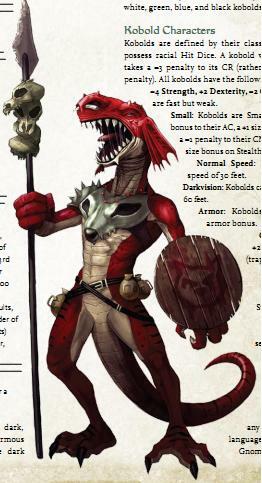 Armor: Kobolds have a +1 natural armor bonus. Crafty: Kobolds gain a +2 racial bonus on Craft (trapmaking), Perception, and Profession (miner) checks. Craft (trapmaking) and Stealth are always class skills for a kobold. Light sensitivity: Creatures with light sensitivity are dazzled in areas of bright sunlight or within the radius of a daylight spell. Languages: Kobolds begin play speaking only Draconic. Kobolds who have high Intelligence scores can choose any of the following bonus languages: Common, Dwarven, Gnome, and Undercommon.